The owner is the only person that answers the phone and when the shop is busy he may not be able to answer the phone. Please use email, Facebook, Google Messenger, or Live Chat (on this site) if you cannot get an answer via the phone We do not take out of state calls sorry. Is the website up to date? Yes the firearms inventory listed on this website is updated before we open every morning Mon.-Sat. We even update during the day as items sell if time allows. FYI - The firearms on this page are available for purchase at our retail location. Out of state customers please read our policy page. Is something out of stock and you want to know when it is coming in? Go to our Guns Coming Soon page (link on the home page) for an updated daily list of firearms in the process of shipping to us. If you want to know when they arrive subscibe to our daily email newsletter (link on the home page). We send a list of coming soon and new arrivals to you every day. That includes new and used. Every new and used firearm we stock is on our website. The website is updated 6 days a week every morning before we open and even throughout the day. (most collectable firearms will be listed on our Gun Broker page and not listed on our website) If you don't see it we don't have it however we can order anything other than Kimber, Stoeger, and Benelli. Military Discounts? - Sorry we do not offer military discounts only a cash discount on firearms as seen on this website. Our prices are set to a low profit margin already so we cannot offer any further discounts. Thank you for your service. FFL Transfer questions see our FFL Transfer page for more information. I want a quote on a new firearm. Please supply the part number and description of the firearm and I will email you a quote. Most quotes will be supplied with a cash price. The price would be more for credit of debit. Please understand if the firearm just was released to the maket it may not be available. There is a hot new gun I have to have. I know they are not in available but can I pre pay for one and you can let me know when it comes in? No, we do not accept pre payments on firearms that are not in stock at our suppliers. We do not take back orders or have a call list. Please keep an eye on our website and check with us at a later date. Are you interested in taking my gun in trade or buying my estate collection? We always are interested in purchasing or taking in trade Civil War, WWI, WWII, Vintage, Collectable, or Antiques firearms. We do take in modern firearms and current production firearms in as well but we do not take every gun that walks in the door. If you have an estate collection we will buy them all. You can just bring them into the shop if you have a small collection. For large collections you may want to come in or email us about an appointment. The owner Fred will come to you if needed and help with your estate as much as possible. See our Buy-Sell-Trade page or www.mainegunbuyer.com for more information. How much is my firearm worth? How much will you give me for firearm? How much is the trade in value of my firearm? We will not discuss values of firearms online or on the phone. We must see them in person. What is MAP Pricing? Minimum Advertised Price That is the lowest advertised price allowed by some manufacturers. You are allowed to sell for less but you cannot list the lower price on your website or on the price tags. Please ask for pricing. Do you price match? Yes, we will try our best to price match. We will only compete with local Maine dealers. We will not compete with box stores or out of state dealers. New firearm prices must be listed on that dealers website. Pricing must be regular pricing not clearance or sale pricing. For more information on price matching click here. Can you do a background check over the phone? Absolutley not. You must be present for a background check. What kind of ID do I need to puchase a firearm? What are the requirements? You must be 18 to buy a long gun. You must be 21 to buy an other firearm, handgun, or receiver. 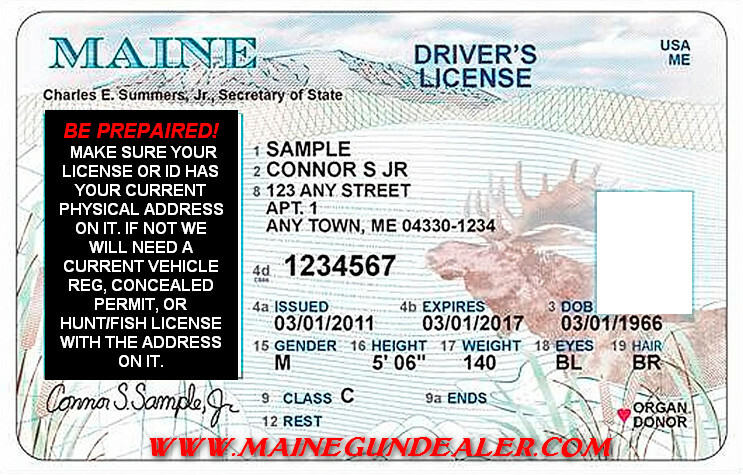 A MAINE DRIVERS LICENSE OR STATE PICTURE ID IS REQUIRED FOR ALL OF THOSE WHO PURCHASE A FIREARM THROUGH US. PLEASE MAKE SURE THEY HAVE YOUR CURRENT PHYSICAL ADDRESS ON THEM AND THEY ARE NOT EXPIRED. IF NOT YOU WILL NEED A CURRENT VEHICLE REGISTRATION, CURRENT HUNTING LICENSE, CURRENT MAINE TEMP DRIVERS LICENSE (ONLY IF YOUR ORIGINAL DRIVERS LICENSE OR STATE PICTURE ID IS NOT EXPIRED) OR CURRENT CONCEALED WEAPONS PERMIT WITH YOUR CURRENT PHYSICAL ADDRESS ON IT (Must have a photo). NO PO BOXES. We do not sell to non residents of Maine or Non US citizens. Our policy requires that you must be Maine resident and a United States citizen for us to sell or transfer a firearm to you. Not a Maine resident or US citizen? : We do not do sell firearms or offer firearm transfers to non residents of Maine or Non US citizens. Our policy requires that you must be Maine resident and a United States citizen for us to do a transfer or sell a firearm. Have a quick question? Want a quick answer? Use our LIVE CHAT option located at the bottom of the home page. Available during normal business hours. If the shop is busy we may not be able to reply sorry.